Today is one of those days I feel the pressure of being a Second Season Mom. Up early to make a decent breakfast for my girls so they’d have a great start to a day full of tests. Then, slip in some exercise in an attempt to minimize the “muffin top” that appeared out of nowhere two years ago. Start the laundry brought back from my husband’s recent annual golf trip. Run to the real estate office making effort to get in a little “real” work. Then back home to finish up the pot of taco soup and make a fresh batch of Mexican Cornmeal Muffins to take to my in-laws. My step-mother-in-law had a pace maker put in today. That leaves my father-in-law at home alone. Not the best of circumstances, but he’s too set in ways to spend the night with us. So, prepare the dinner and spend the next day or two checking in and tidying up. Thankfully, one of my girls has more compassion than the rest of us put together and is an incredible caregiver. She will relish in helping to take care of her Popoo, and he will gladly recline and let her! It would have been easy to let the pull of multiple generations stiffen my neck and quicken my breathing. But it wouldn’t have accomplished anything different. So instead, as I enter this time of reflecting on what life holds next, and my thirty one days of thanksgiving, I chose the path less trod. I made a point to breathe deeply. I lingered on the back porch a few extra minutes after exercise, drinking a tall, cool glass of water. I opened the sunroof and turned the radio OFF as I drove to and from the office. And then, then came the very best. I decided to make an extra pan of Mexican Cornbread. I pulled out my grandmother’s iron skillet, one that belonged to her mother. Warm memories flooded over me. What could have been viewed as one more “thing to do”, suddenly became a gracious gift of love. 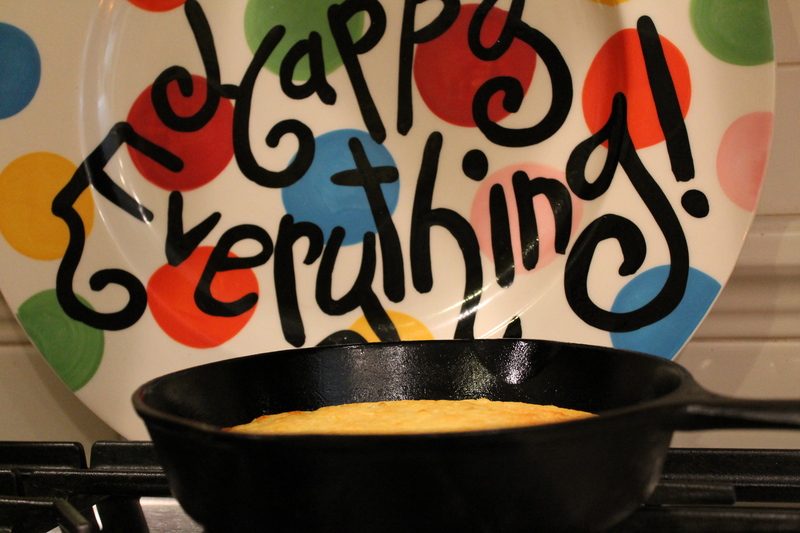 How many times had my grandmother made cornbread in this very skillet? How carefully she had shown me how to season and care for this antiquated piece of iron. How graciously she had shared her recipes with me. How patient she was as I sought to follow her directions. In those moments I came to know her best. What a privilege to hold this blackened iron pan. What a privilege to season it ever so lightly and follow her tried and true recipe. What a privilege to provide for my family-whether immediate or extended. And as I took the moment to be grateful, it hit me. My grandmother, and many Southern women just like her, was a lot like that iron skillet. Life was hard for my grandma. She grew up in poverty, but loved. She was the oldest daughter and therefore took on a lot of extra responsibility and gave up “schooling”. She lost her husband early in life and had only one child, despite many miscarriages and hopes for more. With gladness she let that only daughter, son-in-law, and two young grandchildren move across the oceans to serve as missionaries. She was tenacious though. Or better yet, tough like cast iron. You wouldn’t know it looking at her petite frame, high cheekbones and crystal blue eyes. But underneath, she was iron. Her faith kept her going, kept her strong. She never let the hardships get her down. Instead she let them season her. And as she aged and seasoned, she grew in strength, dignity and wisdom. She knew true joy. A woman with little material possessions, she experienced true contentment. She gave generously, She worked hard. She loved without restraint. And all of that, she sought to pass down to her grandchildren and great grandchildren. So, as I use that old iron skillet, I will stop and remember. I will think about how grandma seasoned my life with scripture, prayer, words of wisdom and fried chicken. I will be grateful. I will pass it on.